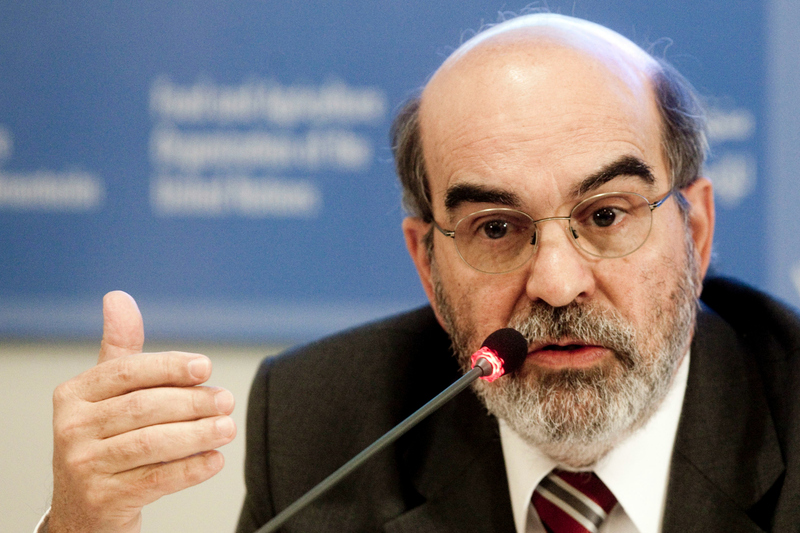 José Graziano da Silva, director-general of the FAO. [FAO]. José Graziano da Silva is an American-born Brazilian agronomist and writer. He currently serves as the director-general of the UN Food and Agriculture Organization of the United Nations. An estimated 842 million people were found to be chronically hungry between 2011 and 2013. Globally, one in eight people are unable to gain regular access to enough food to be able to study, work, ward off disease, and otherwise live healthy and productive lives. Agriculture remains the key pathway to improving both access to food and income for most vulnerable families worldwide. Policies aimed at enhancing agricultural productivity and rural development, especially when smallholder producers are targeted, can help to create employment opportunities and achieve hunger reduction – even where poverty remains widespread. But the quest for better lives must necessarily address another, often intertwined issue, that of malnutrition in all its forms. At least 2 billion people suffer from various vitamin and mineral deficiencies and related diseases. Malnutrition undermines well-being at all ages, and is seen as the underlying cause of death for some 2.6 million children annually. In some of the world’s most vibrant and influential developing countries, malnutrition is threatening the next generation of parents, teachers, scientists and leaders. Inadequate nutrition causes stunting, weakened immune systems and difficulties in learning and concentration. If having access to enough food is necessary for a person’s survival, then getting an adequate combination of safe and nutritious foods is fundamental to his or her future, and to the well-being, health and development of entire communities and economies. Some progress has been made in reducing hunger over the past two decades, as measured by the Millennium Development Goal (MDG) objective of halving the prevalence of dietary energy undernourishment by 2015. Already, about 60 countries have achieved the target against 1990-91 benchmarks, or are on track to do so. There has been progress, too, against malnutrition. Child stunting – a key indicator of malnutrition – has declined, but if present trends continue, half a billion more children will still experience stunted growth over the next 15 years. Meanwhile, around one and a half billion people are overweight, with half a billion deemed obese, and hence, more vulnerable to diet-related non-communicable diseases. Malnutrition has a price tag. It could cost as much as five per cent of global income – $3.5 trillion, or $500 per person – in terms of lost productivity and health care expenses. All this makes transforms nutrition in a public issue. And the conversation about malnutrition and hunger may be scientific, social and economic, but above all, it is political. Good nutrition starts with access to nutritious food. Food systems must be improved in ways that make nutritious foods available and affordable to people throughout their lives, as shown by FAO’s most recent The State of Food and Agriculture: Food systems for better nutrition. But overcoming malnutrition in all its forms – caloric undernourishment, micronutrient deficiencies and obesity – requires a combination of appropriate interventions in food systems, public health, education and social protection to guarantee availability and access to nutritious food, reduce the vulnerability of poor populations to disease, and improve consumer awareness of the sources of good nutrition. Food systems must place extra priority on meeting the special needs of mothers and young children. Malnutrition during the critical first thousand days from conception can cause permanent physical and cognitive impairment in children and lasting damage to mothers’ health. In most governments, nutrition lacks a natural home and a responsible official. Nutrition is a public issue and Tackling it is a complex task requiring strong political commitment, leadership at the highest levels, as well as unprecedented cooperation and coordination among various ministries and partners. Fortunately, policymakers and community leaders around the world are making some progress in turning up the volume of the conversation on malnutrition and placing the topic, along with food security, at the apex of the international development agenda. The UN Secretary General’s Zero Hunger Challenge, launched in 2012 at the Rio+20 Sustainable Development Conference, recognized the intrinsic link between development and proper nutrition for all. It calls for a world without hunger, no more stunting, zero food waste and loss, sustainable agriculture and a doubling of poor farmers’ incomes. Food security and nutrition have also been placed squarely at the center of discussions to define the work of the High-Level Panel on the Post-2015 Development Agenda; and at high-level meetings hosted in London in 2013 by the UK and Brazilian governments. The volume of the conversation on nutrition is about to be notched up further. On 19-21 November 2014, the FAO, WHO and others in the UN system will co-organize the inter-governmental Second International Conference on Nutrition (ICN2), 22 years after the first one in 1992. ICN2 will establish the bases for sustained international cooperation and improved policy coordination to overcome malnutrition. It should also help to ensure that different voices are heard in the debate. While governments have the final say on policy matters, non-state actors have important contributions to make to the multi-dimensional challenge improving nutrition. By cooperating more effectively, we have a real chance of ending this blight on humanity within a generation. But only if the conversation turns to concrete, consistent action that reaches every family.